I've been thinking a lot about brains lately, how we're wired, what the impact of that is on each of us. 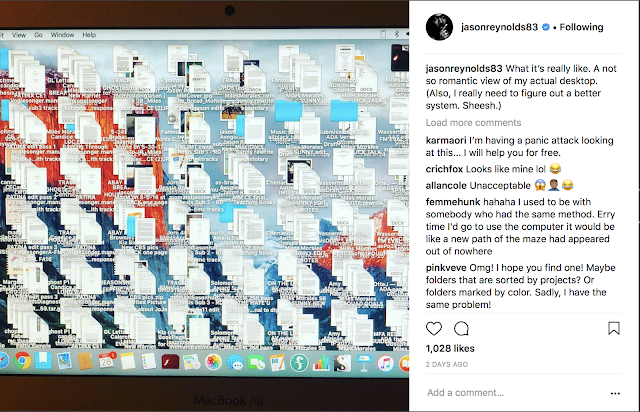 It started when I saw this photo the author Jason Reynolds shared on Instagram a few days ago of his computer desktop. There was no way anyone would have over 10,000 unread emails, right? I think I shared it with the comment that I was the icon on the left. To my shock many friends began commenting that they were the one on the right, but their unread emails were numbering around 20,000 or 30,000. Seriously, I got shivers. As I swam, I considered this. Jason's desktop. My friends' unread emails. 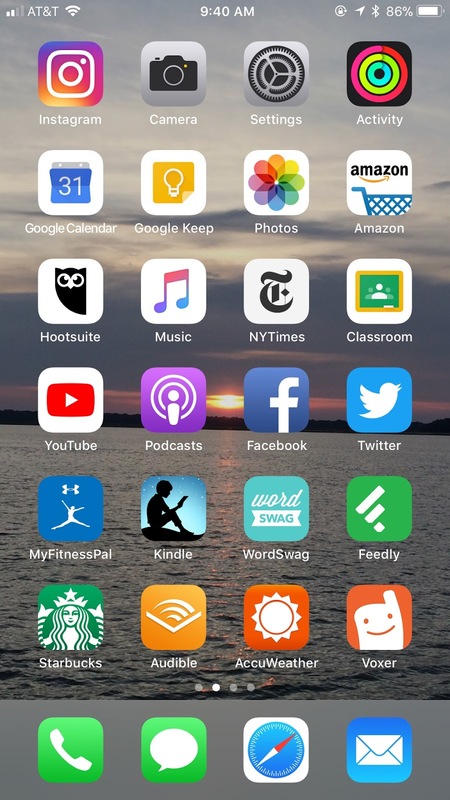 I thought of my dad, how he and I both hate the red notification bubble on our apps on our phones. I have notifications only turned on for my email and texts as a result. If I have notifications in any social media apps, I will know when I go to said app. I don't want to see it calling to me. So what does that mean? Is it just the way our brains are? This made me recall a text conversation with a friend recently. Her son commented that when I picked he and my oldest up, I was always on time while she was always late. She apologized in case Luke was upset. I explained that being late gives me massive anxiety. As a result, I'm always on time to five minutes early. But I thought more about that. I have friends who are always late, you just plan on it. I could care less if anyone else is late as long as it doesn't make me late, you know? But if that's their default, and mine is to be on time or early, how did we get that way? I swam, and swam, and swam and the laps racked up. I thought of all the idiosyncrasies we all have. At forty-three I am perfectly comfortable, for the most part, with who I am. I know what causes me to get anxious, I know how to feel relaxed. I know how I learn best, how to be my most productive. I know I'm surrounded with people who think like me, and others who have opposite tendencies. We are all successful. 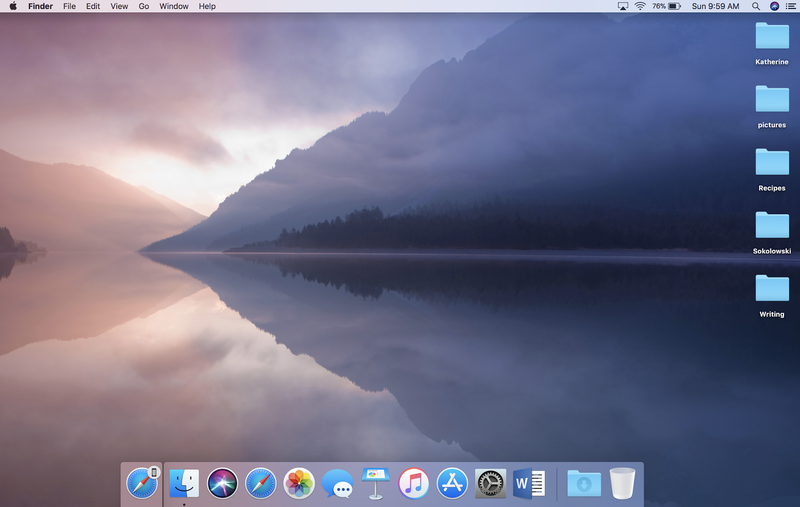 I don't think that my habits of keeping a clean desktop, no notifications, or being on time are "right", and the opposite isn't wrong. We all figure out what works for us. That being said, as my pool laps were drawing to a close, my mind turned to my classroom. How do we set up learning so that everyone can work in a way they are comfortable? With the habits that work best for them? I think choice is a huge part of this - choice in what they read and write, choice in where they sit, choice in working for long periods of time or breaking that chunk of time up and doing several tasks. But what am I missing? I'm not sure. I want the environment in my classroom, in our classroom, to be one that works for all students, whether they share my tendencies or not. This isn't something I've figured out, but something I'm still thinking about. If you have any ideas on this topic, please share with us all. One things I do know is that my friend Donalyn is right when she often says, "The smartest person in the room is the room." This new year I plan on returning to the classroom and thinking about this more with my students. I'm curious to see what they notice about how they are wired. 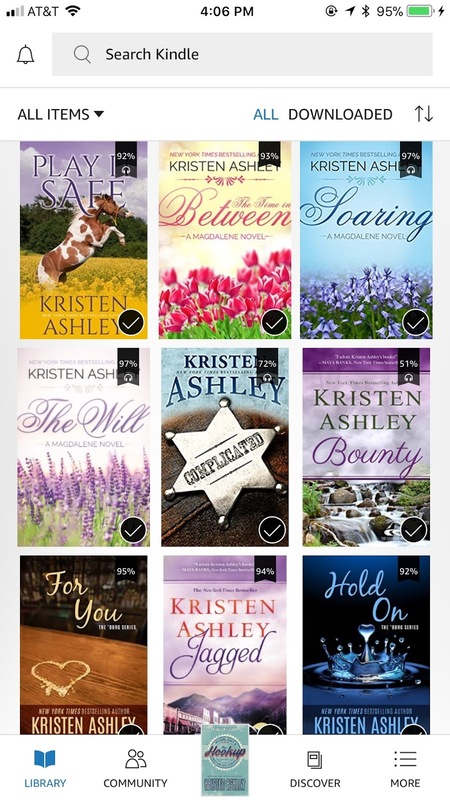 Lots of books by Kristen Ashley. Lots of romance. Nary a young adult or middle grade book in sight. It all began this summer with the recommendation from a friend of Ashley's book Breathe. I read it, was a bit surprised by the amount of "romance", having not read anything written for adults in this genre for about twenty years. That being said, I loved the book. 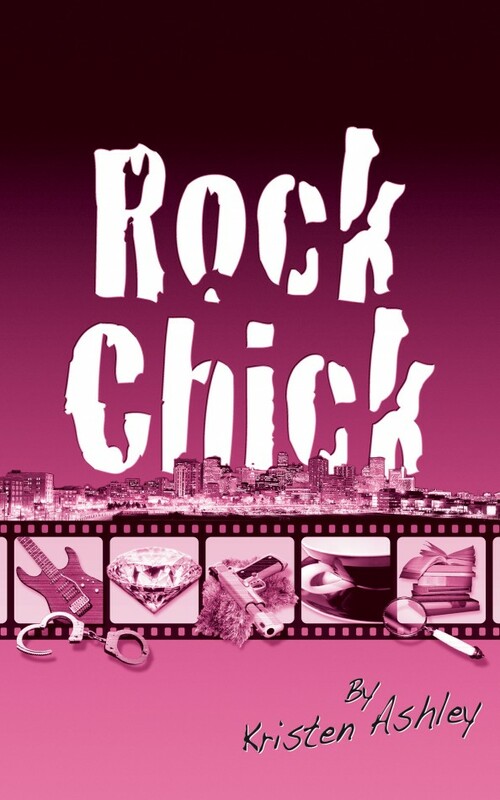 I loved the quirky characters, the small town, etc. When I found out that I had accidentally read the fifth book in a series, and ever the completionist, I went back and read the series from beginning to end. And then the next series, and the next, and a stand alone book here and there. So while I've not been reading for my students this semester, I have been reading for me. While doing so, I've learned some lessons along the way. So, in no particular order, here's a few of the lessons I've gleaned from Kristen Ashley's books this semester. In the last few years I've had great friends who have given me some grief for my single minded devotion to reading for my students. I love middle grade and YA books, so I'd tell them it was no hardship. Truly, it isn't. I do love those books. But when they'd tell me to read romance, to read something for adults, I'd say no, romance wasn't my favorite genre. Now, I've reconsidered. Reading these romance books has reminded me not to box myself in, but try all sorts of books - and remind my students to do the same. You never know when you will find a favorite book or author that you wouldn't have "met" before. I love reading books in a series and I remember being appalled when a friend's daughter was told "series reading" was not allowed to "count" in their middle school classroom. I'm not sure if that teacher is a reader because that makes zero sense to me. Kristen Ashley writes a lot of books that can stand alone, but are part of a series. I have always hated finishing a book because I grow to care about the characters and don't want them to be done. Seeing them appear in other books not only gets me more attached to the new book, but makes me fall into that world faster. The same is true for my students. Another colleague and I have talked about plot driven vs. character driven books. This colleague is a plot driven reader, while I often say if I love the characters, I'm hooked on the book. Ashley's books reinforce that notion for me. I told my husband that her characters reminded me of Gilmore Girls, with super racy romance thrown in for good measure. I love quirky characters that I can completely visualize. I feel like I know these people - their likes, favorite foods, clothes, etc. My students know that I cannot stand a long exposition in a book (a term I only learned when moving from 5th to 7th grade last year.) No fear here, Ashley jumps right in at the start of every book. The character's voice pulls me in immediately. Through these books I've learned more about myself as a reader. When I was in high school as a freshman, the mini series Lonesome Dove was on TV. My sister and I watched it many times. I bought the book and read, and reread it, until it fell apart. We mapped out the cattle drive on an atlas. I looked at where they'd be at certain points in the book/ show. I immersed myself in the story. Ashley's books allow me to do that too. She talks about restaurants the characters go to, clothes they wear, songs they listen to. For the most part, they are real places, real songs, real items. I can look them up, check out some images, listen to some music, and the character's world is built even stronger. On Ashley's website she even includes recipes from some of the books. She also adds many images that inspired her to her Pinterest page. In this era of technology, I need to remind my students of these resources. I want them to realize that they could look up things mentioned in their books, if they'd like, and that might give them a more immersive experience while reading. I joked with my classes the other day about romance books. Many of my students are currently reading YA romance. After a book talk from one student, a boy said he wouldn't read "x" because it's for girls. I reminded him that there are no boy books, no girl books, just books. I also pointed out that YA romance books might teach you some lessons about how to be a good partner in a relationship. After coming home to begin my break, I read Ashley's newest book, The Hookup. I laughed when one character explains to another what it means to women when a man will come in, hold a baby, change a diaper, etc. She says, "Men don't get it. If they knew how much women like it when they took care of babies, the moms wouldn't get anywhere near their child." See, even husbands could learn something here. Maybe then they'd quickly grab the crying baby in the middle of the night, or take the dogs out in the morning. Life lessons indeed. Overall, my five month reading binge of forty-seven of Ashely's books (many over 500 pages) have reminded me of the lesson from the flight attendants when you get on the airplanes - we need to put on our oxygen masks first. For at least the past seven years my reading life has been completely geared toward my beautiful students. This doesn't, by any means, mean I need to stop reading for them. 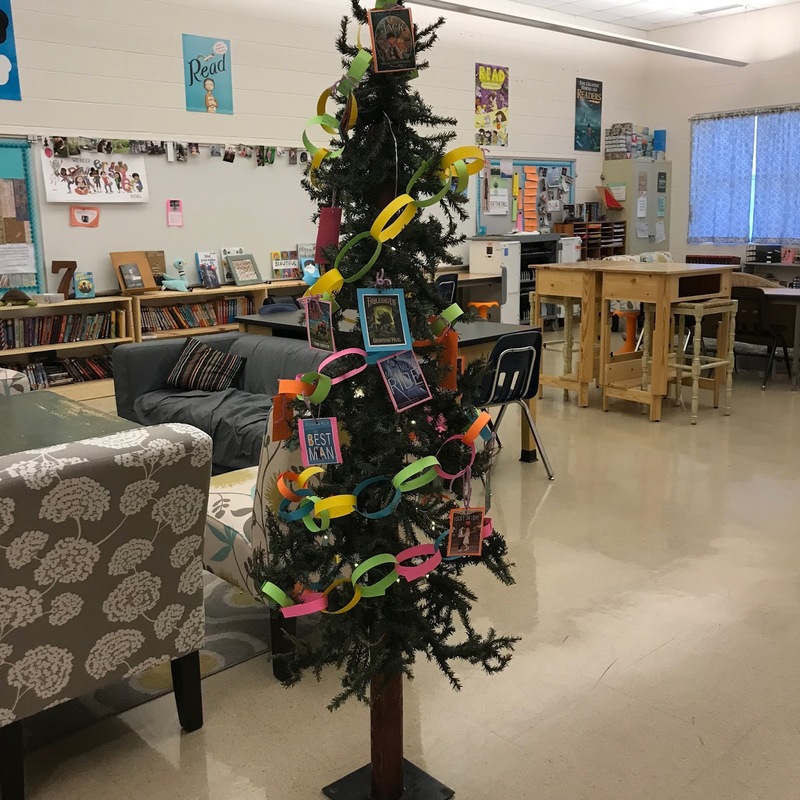 The constantly tell me that the reason they read so much in our classroom room is because I read what they read, I can talk to them about the insanity of the end of a book, the pain of waiting for the next one, the love (or hatred) of a certain character, etc. So yes, I'm still planning on reading YA and middle grade. But I'm adding back in books just for me. Books that I can become addicted to. Books that I wait for, impatiently, even though Ms. Ashley writes at a crazy fast pace. My oxygen mask is firmly back in place and not going anywhere again. And I need to plan a trip to Colorado. Oh gracious, what fun reading. 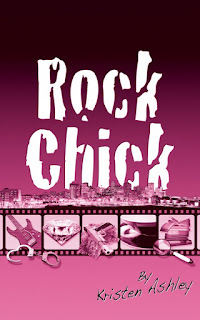 If you want to try any of Kristen Ashley's books, I highly recommend starting with The Rock Chicks series and reading them in order. My day began on a sour note for a Wednesday, one of my favorite days of the week. I rose at 4:30am to the sound of the wind howling outside and a Golden Doodle puppy, Leia, crying for a nearby room. She likes to get up around then each day, just to see if I'm still around. Whatever. Taking her out I considered the time and decided to head to Champaign to swim before school, especially since I missed Monday. I walked both dogs, got ready, and hopped in the van to head to Champaign. Glancing at the display in my van, I was happy to see that it was only 5:20am. Plenty of time to drive over, swim for a half hour, head to Starbucks, and drive back. As I approached the edge of town I noticed my van was sounding strange. Straining to get it above 35 mph, it clearly brought back bad memories of me trying - and failing - to learn how to drive a stick shift. I glanced at the RPMs. Hmm. I know zip about cars, but I don't think the RPMs are supposed to approach 4. I pulled over, restarted the car, drove on thinking all would be well, but nope. Irritated, I returned home and curled up on the couch to read a romance novel. Something good had to come from this early hour. School began and the day looked up. Our quick write was off of an older video on Steph Curry. (HERE) I wanted to talk about work ethic, about overcoming adversity, and this fit in well. We completed our study of sentences with appositives and talked about a required blog on their genre book for second quarter. And then it was time for our Mock Caldecott selection of the day. I've worked with Margie Myers-Culver for the last few years on a Mock Caldecott unit. I'm blanking on whether this is our 5th, 6th, or 7th year, but it's been awhile. Each fall/winter we select around twenty books we feel are Caldecott contenders for that year. Sharing them with kids, we analyze, discuss, and rate the nominees. Shortly before the ALA awards we have the kids select their top picks and then Skype to share what we selected with each other. I love it. 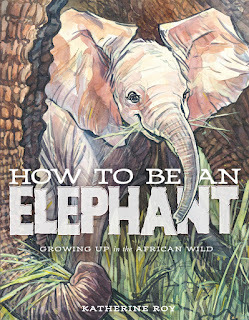 Today's selection was How to be an Elephant by Katherine Roy. First we talked about her book I had shared with these same classes back in fifth grade, Neighborhood Sharks. We compared the two books and a student in my last class mentioned they'd absolutely be able to recognize some of her illustrations if asked. Another kid spoke up, "I'd recognize Klassen's illustrations for sure. And one to my right looked over and said, "After the Fall was by Santat, right? And so was Beekle? I'd recognize his stuff." I grinned. We looked through the book. Conversations ranged from umbilical cords, gestation periods, birth in the wild, habitat, olfactory systems, and more. I was fascinated by their thoughts. I drove home from school with a van functioning like normal and a light heart. My day started out on a bad note, but it was all uphill from there. Now just to cook dinner and squeeze in some more reading time. I cannot wait. If you'd like to see what books Margie and I selected for this year's unit, I've posted the list below. Lordy. Today is one of those days...No, scratch that. This week has been one of those weeks where I want to take all of the folks with all of those opinions about what we do in the classroom and make them job shadow me 24/7. Then, we're having a chat. At the end, I expect a raise. A big one. 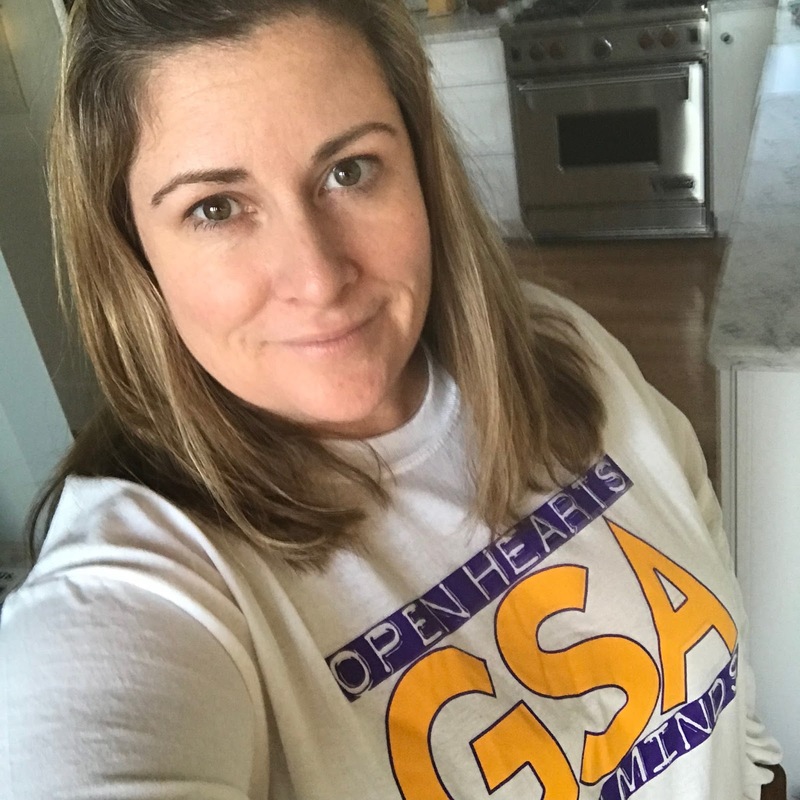 Make no mistake about it, I don't mean my principal, my superintendent, or my school board. Nope, they get it. I mean politicians. Parents who like to criticize teachers on Facebook. Reporters and journalists that like to spin negative stories. Yep, those folks need to come hang with me because it has been a week. It began Monday, innocently enough. There was a behavior incident. I had to have a chat with several kids. Everyone was honest. Got to the bottom of the issue in no time. However, I was left a bit disheartened. We had a lot of bystanders, but no real positive leaders it seemed. I thought on that. Tuesday I shared my friend Pernille's heartbreaking blog post about some bullying her daughter is dealing with. (HERE) We talked about what Pernille's daughter should do. We talked about why we always focus on changing the behavior of the victim, not the bully. What does that say? We talked about the need of bystanders to step up. Wednesday and Thursday we wrote. We pondered the quote in the front of our room - Tell your story. If you don't, who will? ~ inspired from the words of Don Graves. Kids wrote narratives and turned them in for rough drafts. Last night I spent five hours reading over those drafts. They say seventh graders are hard, that they won't connect with their teachers, won't trust their teachers. They are wrong. These kids, these beautiful kids, wrote amazing drafts. I asked them to consider the multitude of stories contained inside each of them. I said one story was begging to be told this year. To pick that one and write it. I sat last night and wept. I read about depression. I read about loss. I read about friendship. I read about family issues. I read about laugh out loud moments. I read about times when you feel that you are not enough. I read, I read, and I read. Then I emailed. Many stories required an immediate contact to home, to check in. Many families and I chatted throughout the night. I wrote a paragraph response to each child, sharing some suggestions for their final draft. Often, I just shared that I was there for them. Today I headed back in to the classroom. We were decorating trees for our advisory class. I was grateful to begin the day on a light note. As the announcements rolled through the intercom, one of my students whispered to me, "Mrs. S., there is a big tear in your jeans." My head spun to her, "What? Where?" Good grief. I felt behind me and yep, there sure was. I grinned at her as she promised not to tell. I assured her I was fine, pulled my thankfully long shirt down over my behind and said I'd change at my prep period during third hour. Gracious. Classes began. We watched Kwame Alexander's Take a Knee (HERE) and had interesting conversation about discourse in our country. Moving on, we listened to some music while they began to spread out to work on their drafts. As I moved around the room during one class to confer, I told them how impressed I was with their writing. One boy looked up and said, "I'm feeling better now. It's like you took some of this load for me." I stopped immediately and stared at him. That's it. I truly did feel weighed down last night, and today. Some of these kids had hard truths to write about. I began to wonder as I read if I could handle it all. But maybe, just maybe, by writing they are giving up some of that burden to me and I will carry it so they don't have to. That I can do, and will do for these kids. So to those folks that wonder what we do all day, every day, this week is a good example of just that. I am supposed to teach them to read, to write. But really, it is so much more. I'm trying to teach them to be thoughtful and caring citizens. To do that I have to help them see their mistakes, learn to be leaders and not bystanders. Teach them that if they see something, they need to say something. Show them that we can talk about topics that have a lot of emotion, but listen and respect the opinions of others. And finally, I need to show them, my amazing students, that they can hand over what is too hard to carry alone to someone that loves them. That we can move forward together. That is what I do, what we do, and I'm grateful for it.